Blogging is a great way to share your story with the world. I’m still very much figuring out my story and my brand, but I have found tools, both paid and free, that are great time savers. For more great tools, please check out my Recommendations page. There are numerous reasons to have your own self-hosted blog (check out my earlier post here on that subject). I am delighted with my hosting service, SiteGround *. They are amazing, I have yet to contact their customer care but several people in my network who use them swear by their customer service line. I’m confident that if I ever encounter an issue that I can’t quickly resolve myself, I know their customer care line will have my back! If you are a blogger, with few exceptions, you need to be on Pinterest. Tailwind* is incredibly easy to set up. They offer Tribes as well, which is a great way to grow your network and reach. I absolutely love that I can go and schedule a month’s worth of pins in about an hour or two. I will still pop into Pinterest on my mobile on occasion and do some organic pinning, but Tailwind is a huge time saver! Also new, Tailwind has a smart loop option, I’ve only just started to dabble in it, but it looks like it’s a great “set and forget” tool to use to continuously repin your content to some of your boards (which is useful for getting that stuff seen!). For Twitter, I use Crowdfire to grow my following and schedule the bulk of my posts (Like Pinterest, I still do some organic retweets and shares on occasion). I love the option of setting up your competitor lists so you can find people who follow your competitors and boost your own following. Crowdfire makes it easy to see who is following you back and who is unfollowing you so that you can aim to keep your followers and following numbers around the same (Twitter is all about balance). When you’re starting out, MailChimp is a great option, particularly for bootstrapping. Your first 1,000 subscribers are free. One thing you will learn very quickly is your money is going to be in your list. It’s essential to build subscribers and that is where you should focus your attention. Canva is both a free and paid tool, you can get by with the free tools when starting out and perhaps consider moving to the paid tool once you start making money from your blog. This is what I use to make my social media graphics for sharing. This is a perfect website to grab royalty free pictures for your site. Never *ever* use google images as you never know if you’re infringing on someone’s intellectual property rights. Unsplash is guaranteed to have stock images that you can use without fear of legal action and the images are stunning and beautiful! Conclusion – Blogging Is Awesome With the Right Tools! 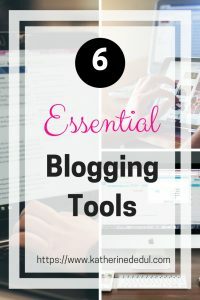 I hope you found this rundown of tools helpful. With blogging, it is a long game, so if you don’t see results right away, keep trying. Do you have a favorite tool? Let me know down below in the comments! If you want more, be sure to join my mailing list for all the latest tips and tricks and as a thank you, I’ll give you a free copy of my 7 productivity hacks! Next week is going to be all about Christmas Cookies, so stay tuned and until then, happy crafting!